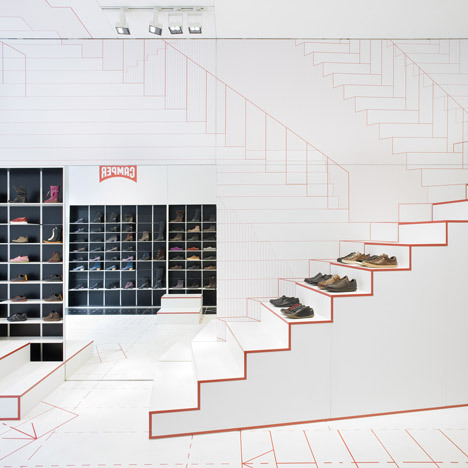 Dutch designers Studio Makkink & Bey have completed a store for shoe brand Camper in Lyon with staircases that seem to go on forever. The stairs form display stands for shoes and are outlined in bright red to merge with graphics printed onto the walls as though the steps continue. More shoes are displayed on recessed shelving and the highest shelves can be reached using mobile blocks of yet more steps. Camper often commission well-known designers to create the interiors for their stores, such as Nendo, Jaime Hayon, and Doshi Levien. See all our stories about Camper here. Photography is by Sanchez y Montoro. Studio Makkink & Bey were inspired by basic walking movements for the design of a new concept store for Camper in Lyon. Movements forward, upward and downward are shaped in staircase pedestals, stools or stepladders and outlined in bright red lines on the stairs, walls and floors. The stairs represent the conjunction of separate places. While performing as a place to meet, sit on or pass through, they expand places and establish rhythm, depth and infinity of spaces. This is the studio's first cooperation with Camper as part of the Together Project.